Save your money on those expensive mechanical brushes and supplies. Studies show a manual brush is equally effective in prevention of dental disease. Our dental team only recommends a mechanical toothbrush in cases where dexterity or ability to properly handle a brush is a factor. 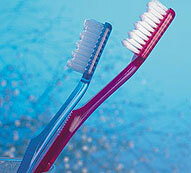 When choosing a manual toothbrush, generally look for a compact head with very soft, rounded bristles.